Being a quilter, I find the need to make a project that doesn't take weeks or months to complete...something that takes just a few hours. That is where these particular projects fit in. Free download here, thanks to Stephanie. I want to make a hundred of these little things. So quick and easy and CUTE! I am proud to say that I now have successfully sewn a zipper. First time ever. It was nice to accomplish this. 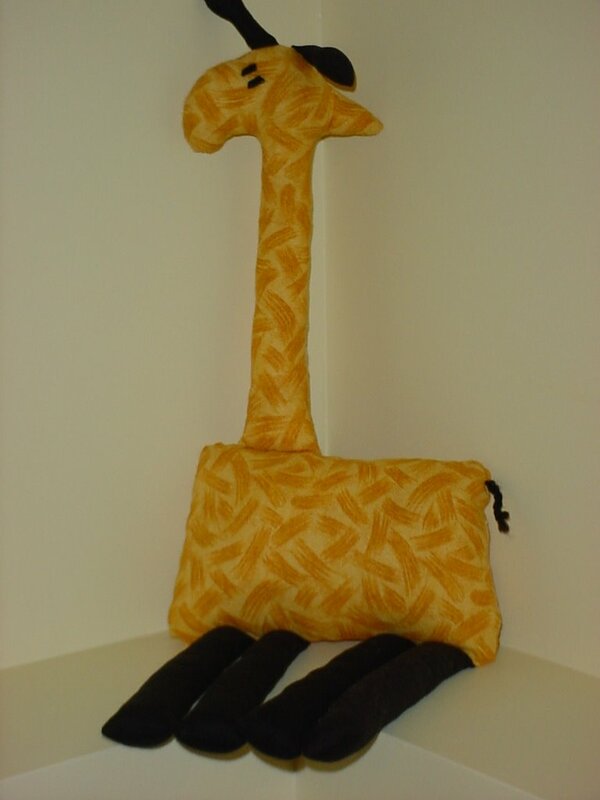 (I had to get out the sewing machine manual to determine which foot was the zipper foot.) 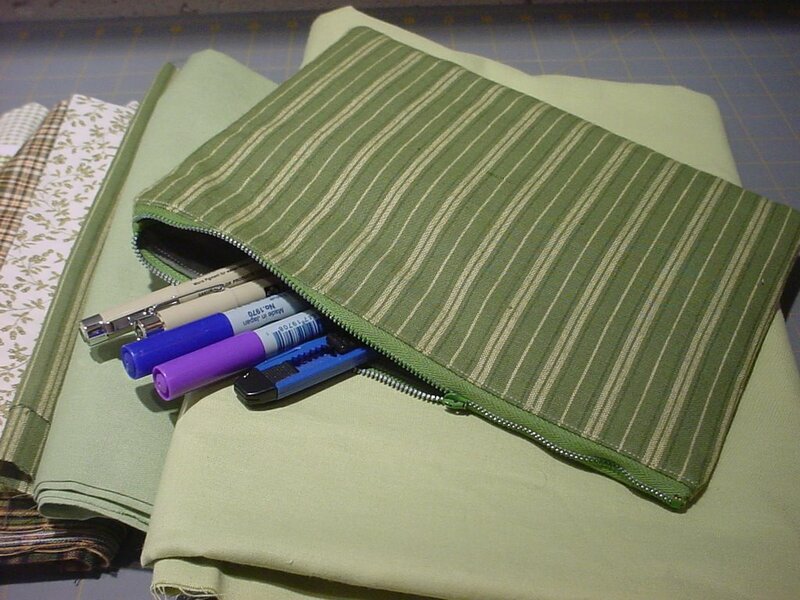 This tutorial was infinitely helpful for making the pouch. Thanks Anna! *does posting get easier? it took me what felt like forever to post this....any tips? please? 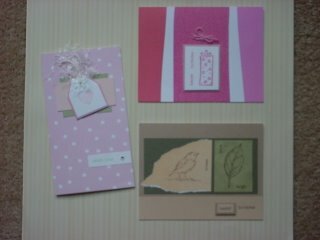 Yesterday my goal was to stamp some cards to send off to a friend. 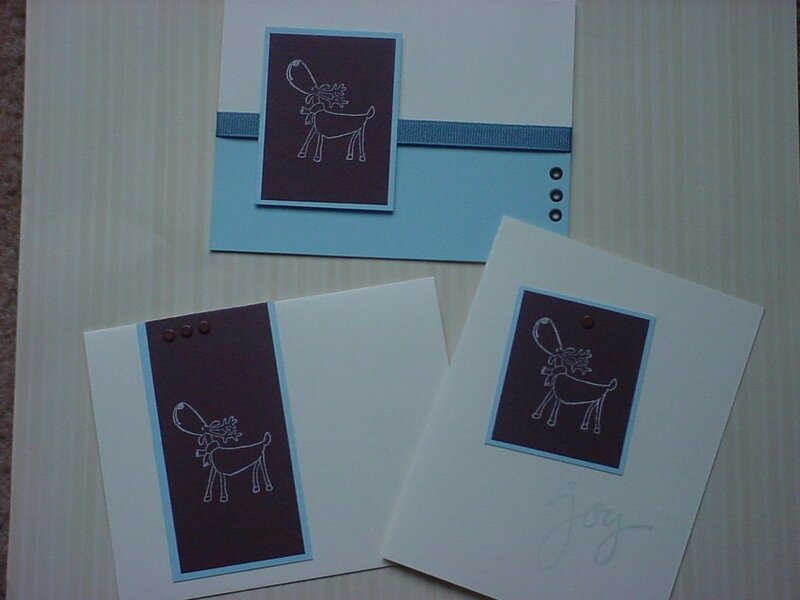 Well, I ended up stamping some Christmas cards and a few other things, but nothing that I had anticipated making. However, I am pleased with the results! (it is hard to photograph cards...sorry about the crummy photos) I don't know why I even make Christmas cards, because I rarely send them out. Maybe this is the year that I change that. This last set of cards were made the last time I stamped cards (or earlier) which was in July, I believe. It was a lot of fun to get out the paper and stamps again after all the sewing and quilting that I have been doing lately. I really enjoyed creating these. But it made me miss my sister an awful lot, and my stamping friends (and former co-workers) too! It's finished! I completed the binding last night...and quilt #13 for the year is done! I usually get the hand finishing done in a few days, it being one of my favorite parts of the quilting process, but I kept getting side tracked by my crochet project. I am finding that crocheting is very relaxing, and tedious, which I seem to love for some reason. My 3 year old took the picture of the quilt. Not too bad, eh? 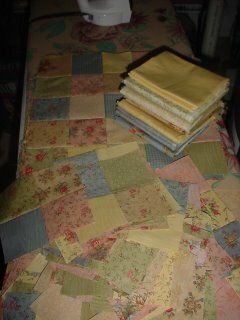 For my work(s) in progress Friday: quilts! 1. Antique quilt that belongs to my friend Erin's mom...this quilt has been a wip for around 40 years or more. 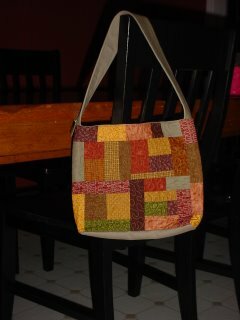 It is about a full size, and I am hand quilting it.(ugh!) Those are all vintage 30's prints. It's all hand pieced except I machine stitched on the borders...I wanted them to stay on. I don't trust my hand piecing skills....no, I don't have handpiecing skills! Isn't this a beauty? I absolutely love the borders. 2. 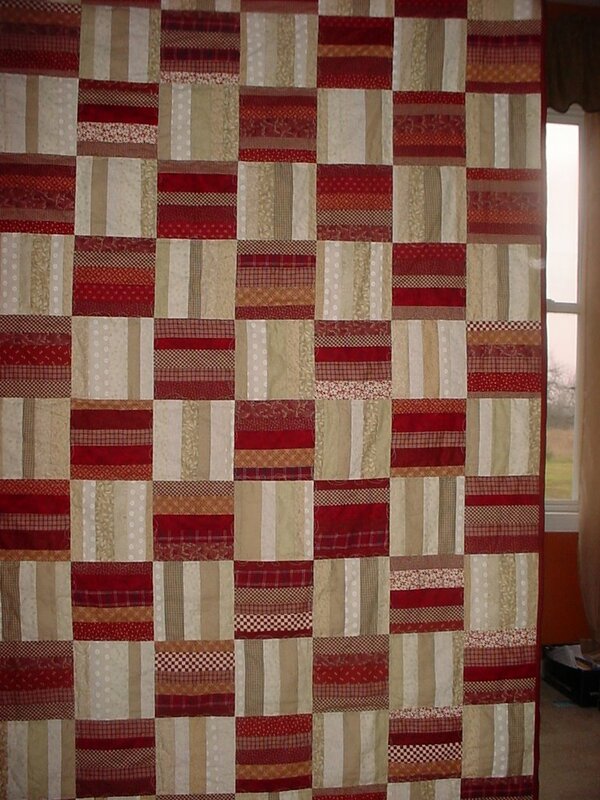 Fall quilt that I was going to get done this year...maybe by Christmas? 3. Eventually will be a throw for my living room. 4. 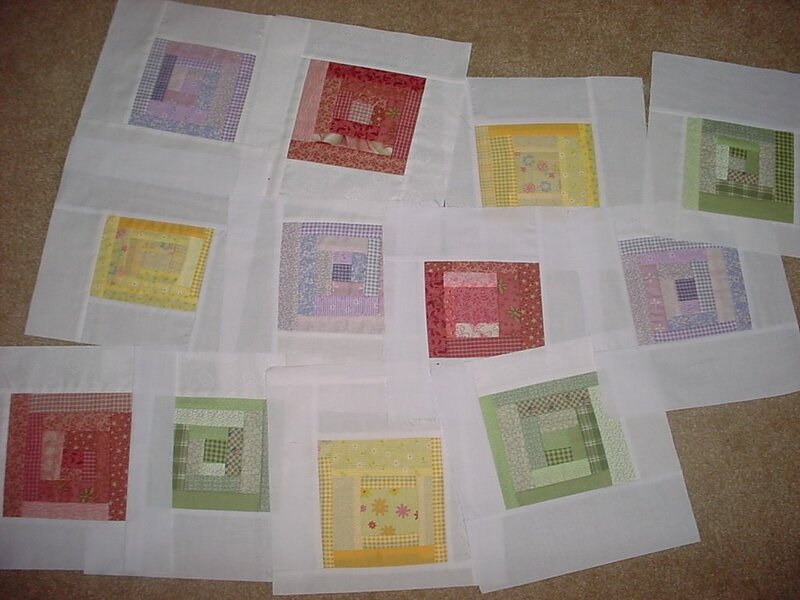 Log cabin blocks-improvised piecing-love this technique. 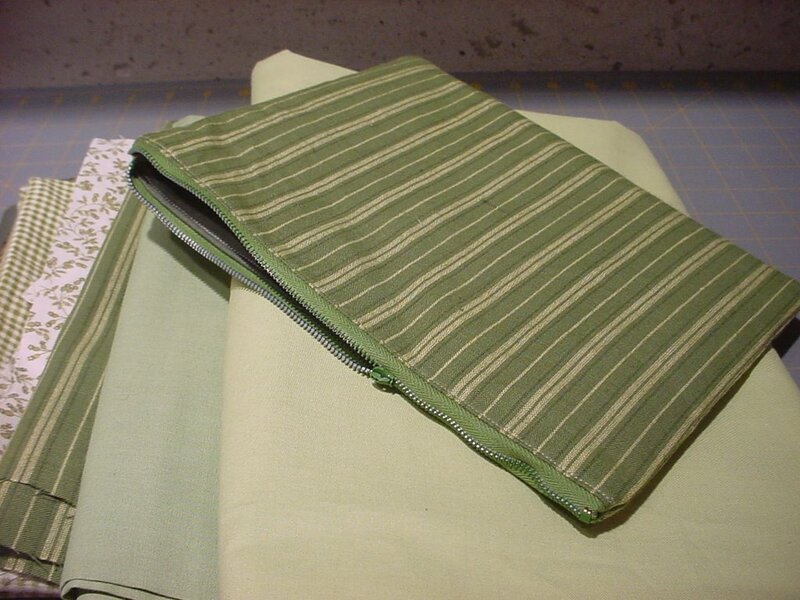 Will either be a baby quilt or a wall hanging. 5. Moda fabrics from several years ago-maybe 4? 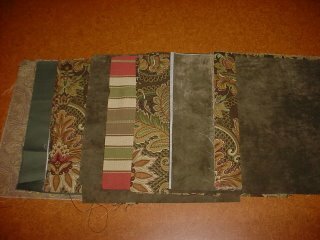 Working on a king size quilt for my bed. 6. 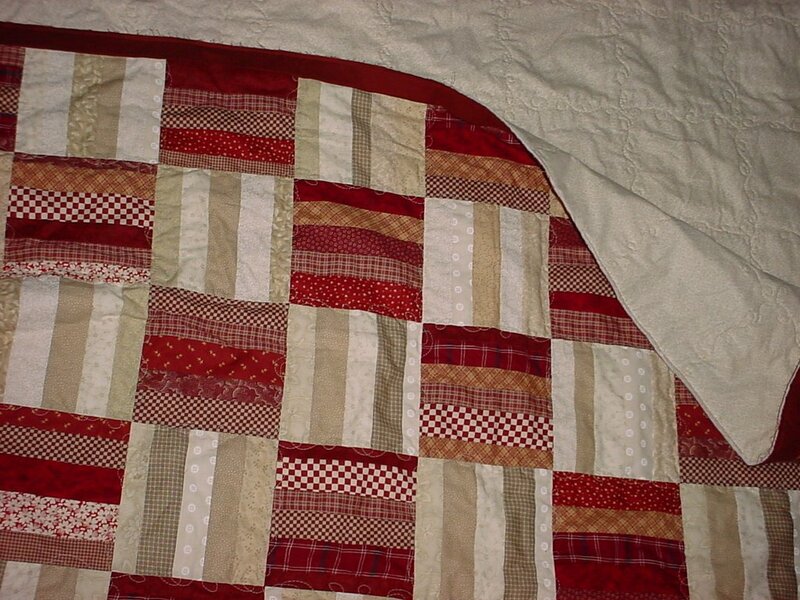 And also this (scroll down to the bottom of the post) red and white quilt...just hand stitching on the binding. I hoping to finish these up by the end of the year. Happy Thanksgiving! It's my favorite holiday...being thankful is very important to me and it is something that I am diligently working on imparting to my children. It's been a great thanksgiving for me this year and I was reflecting on my many blessings throughout the day. 1. I am thankful to God, my Creator, and for the beauty of His creation. 2. To His Son, Jesus, who is my Savior. 3. For my husband...what a wonderful man I married! 4. My children...each one brings a bunch of joy to our (loud) family. 5. My home in the country. 6. My washer and dryer. 8. My new sewing machine!!! 11. A bunch of friends...both near and far. 12. A free country to live in. 14. Being a stay at home mom. 16. My neighbors (many who are also friends). 17. Plenty of food to eat. 18. Plenty of clothes to wear. 19. Blessings too many to count. Not an all inclusive list by any means....I am blessed beyond measure. 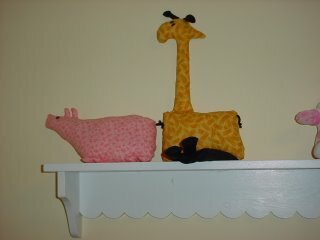 So now the giraffe has a friend. They are sitting on a shelf I made several years ago based on something in the Pottery Barn kids catalog. There are 3 more prints in the set, which I have not yet attempted. This last picture is of a dinosaur skeleton....my 6 year old was off from school today due to PINK EYE! 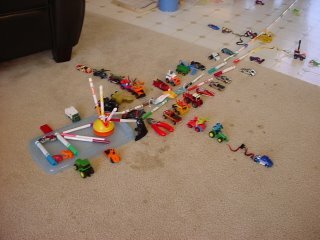 And this is one of the things he came up with to amuse himself today. When I told him it was time to clean it up, he protested. He wanted to show dad. I suggested he take a digital picture of it. No more complaints! Love that digital camera. Not too much crafting going on here today, as I was in taking my little guy to the doctor. He has pink eye, ear and sinus infections. Poor little guy...he is a trooper though. Since I went in to the doctor, I had to stop by the thrift and craft stores to start a yarn stash. So I can make something like this. This will be my first solo attempt at a crocheted project. My husband says I have a sickness. 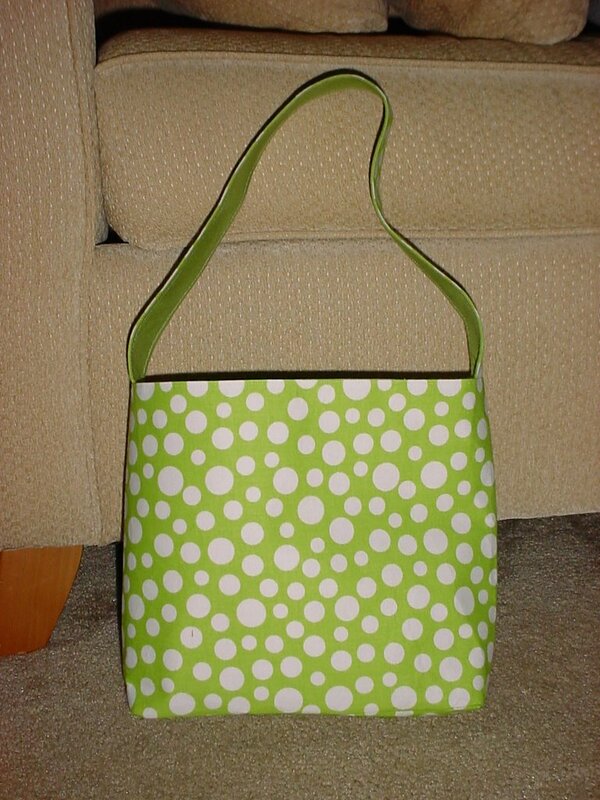 (It's true...) If I had a bunch of yarn ends to use up, I could (maybe) justify a project like this. 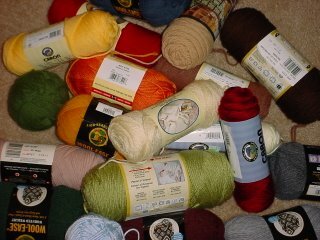 I didn't have a yarn stash until today. So despite the fact that I know I shouldn't even venture into crochet land, I am going to anyway. A few other things that are inspiring me lately: this and this. Love both of these projects. 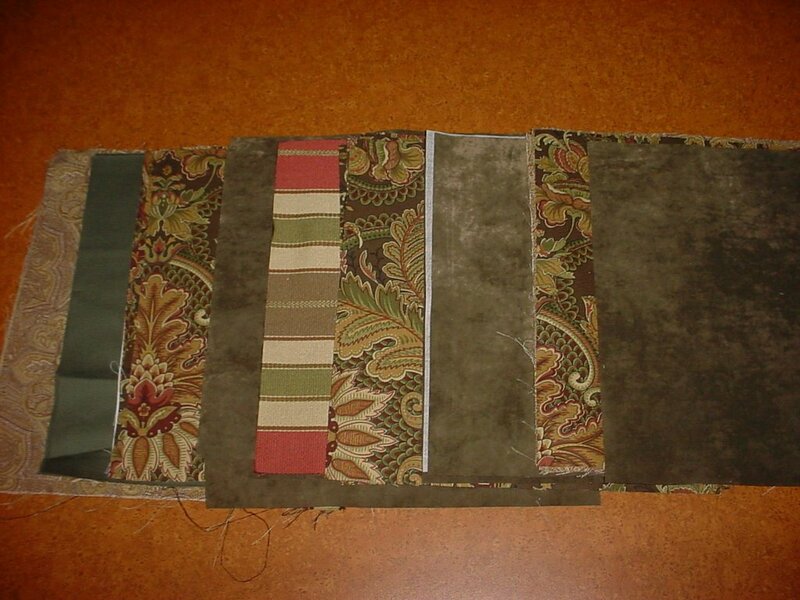 Not that I am going to go coat sewing....maybe a hooded poncho for the girl out of patchwork? Still thinking that one over. isn't that about the way it goes? About a month ago I signed up to do a craft show...I enlisted 2 of my friends to go in on a few tables. I debated it a lot...being indecisive by nature. (to say the least!) But after purchasing my new JUKI sewing machine, I felt obligated to try to make a little cash to help support my crafty habits. Once the decision was made, I kicked into production mode. 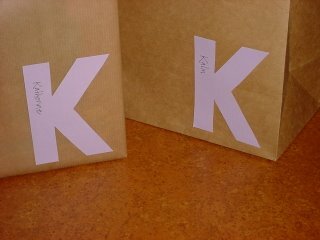 Lists were made, fabric bought, cutting and sewing ensued. 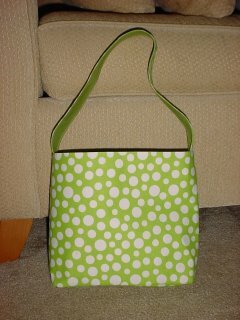 It was a stressful sewing frenzy for 3 weeks. (A long time to run on adrenaline, if I may say so.) Many nights of insomnia, stress and sick to my stomach...all over a craft show. It's pitiful, I know, but its how I am. Well, a week before the craft show, I get a phone call from my sister saying that my grandmother had passed away. Everything came to a screeching halt. We live 5 states away, so we now had a trip to plan, details to figure out and bags (for 5) to pack. I am so glad that we were able to make the trip home to attend the funeral and be with family. My dear grandma was 101 years old. She was fantastic...she helped raise me and my 5 brothers and sisters. When I was young and my bangs were hanging in my eyes, she cut my hair. She cooked many meals for us, cleaned our house. She and I drank many cups of Earl Grey tea together in her fancy china tea cups. (I usually picked the sweet pea one.) She saw me graduate, attended my wedding, and saw each of my three children. Pretty amazing, since she was 70 when I was born. She was a dear woman who lived a simple life. She was a servant...always helping anyone in need. She lived a long, full life and I will miss her so much. I am so thankful to have had her in my life for so long. The funeral was a great tribute to her life. It was so well done, and I am glad to have been there. She had said when she died she wanted to be buried with a loaf of bread in her casket....so when I saw it there it was enough to choke me up. She loved her bread. It was an example of how simple her life really was. 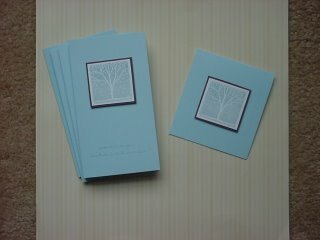 There were meaningful touches thoughout the funeral service. So we said our good byes to my sweet grandma. I will miss her so much. The day after the funeral, we traveled back...the day before the craft show. My dear husband drove 12 hours, we unpacked the van, and he proceeded to make display pieces for my craft show. We were all so tired and exhausted. And still running on adrenaline. We somehow made it to craft show day. I woke up early, set up for the show, and sat all day. The craft show was so disappointing. I sold very little. My friends didn't sell much either. I felt so bad for enlisting them in a crappy craft show. However, my friend and I got to hang out together all day chatting and knitting with no little ones underfoot. That part of it was very relaxing. And it also got the whole craft show gig out of my system. It became clear to me that I should craft for my own enjoyment, not try to make a profit out of it. I do it because I love to create. I am so glad that I have this craft show behind me. Now I can sew for fun again. And read! When I got home from my disappointing day, I walked into a clean house, happy kids and my dear husband. He was cleaning the oven. I love that man so much. He is so good to me and I sometimes feel like I put him through so much. I plopped down and set to relaxing. It's been a long time. Not home 20 minutes, and I realize that my 3 year old is getting pink eye. Isn't that about the way things go? My calendar for the week is automatically cleared: no play dates, no shopping and no running around to find that perfect fabric or yarn. And that is ok. I actually am cooking decent meals again, planning new projects and catching up on craft blogs. It's great to be home. Below are some things that I had made for the show. It's Thanksgiving week...my favorite holiday. I am looking forward to a relaxing week. Spending time with my hubby and kids. And a little crafting here and there. And laundry. And potty training. And cooking. And I think I am going to try to bake some bread. It's good to be back. 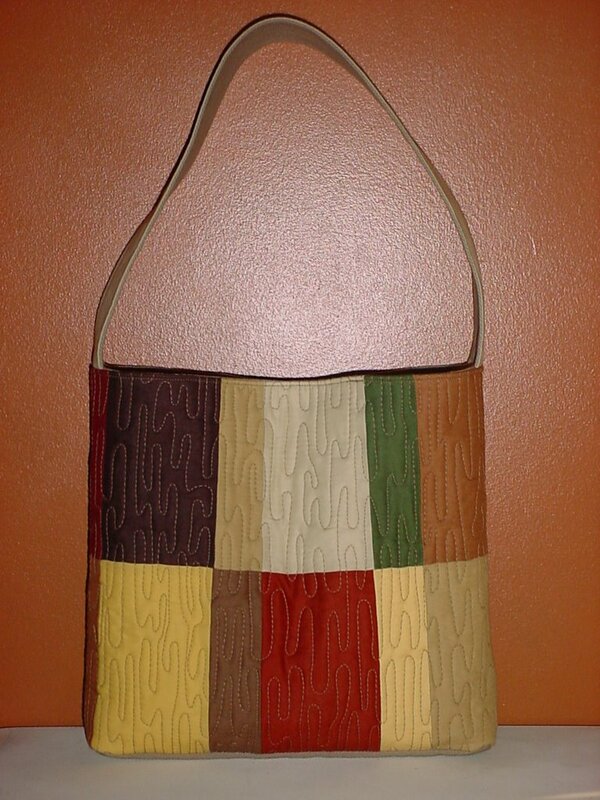 The other side of the purse. 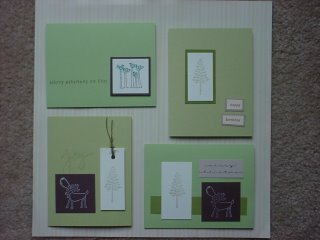 I made this for the craft show I am doing in one week. I can't wait until the show is over so I can sew for fun again. I have also been making quilted baby bibs, place mats, more bags and quilts (for the show and for a very special friend that I will be seeing soon...hopefully). 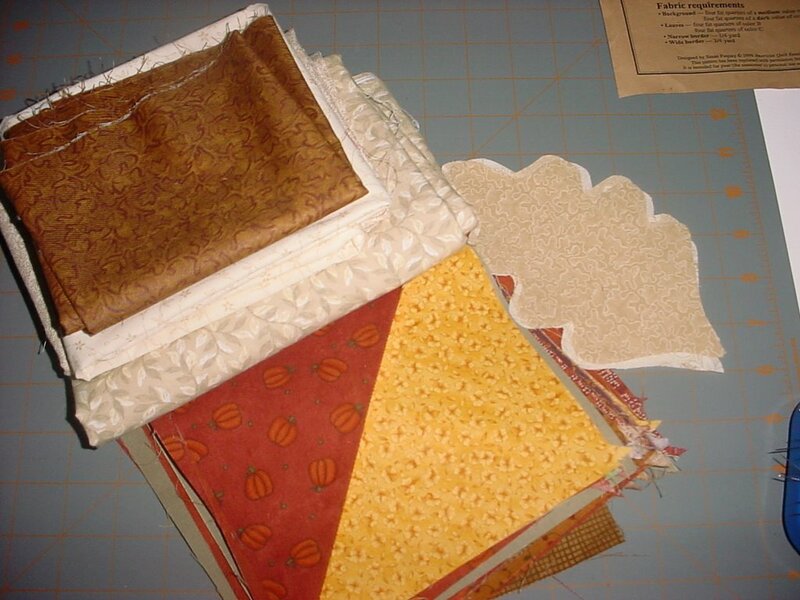 It has been quilting madness around here for the past several weeks. Fun, but I am ready to be able to quilt leisurely again. Or sit around and read all day. That would be lovely! 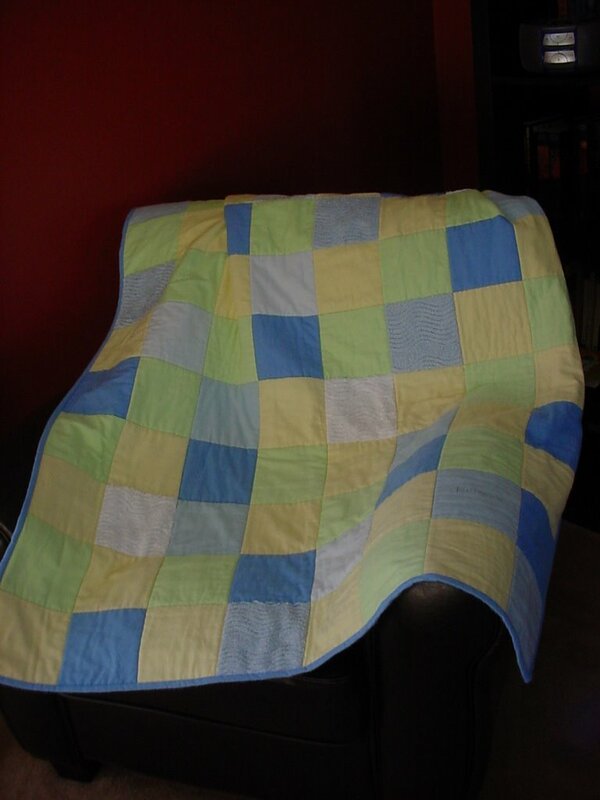 This quilt was inspired by this sweet Pottery Barn kids quilt... 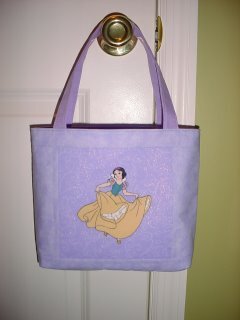 I modified it a bit...I should have added the embroidered running stitch in the sashing. But as I normally do, I rush to finish up a project, then rethink it a little bit more at the end. I do like how it turned out, even without the extra stitching. 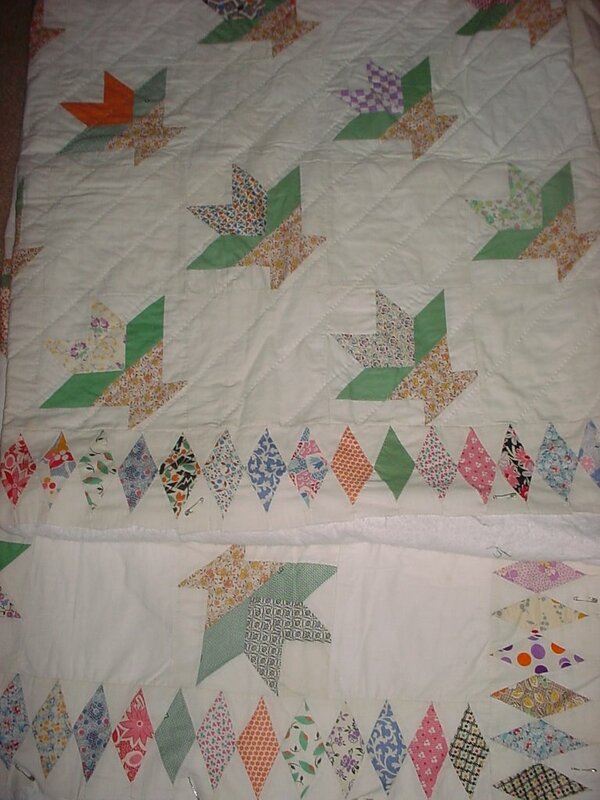 It's a baby quilt, and fairly simple in design, and I still managed to run into some problems with the piecing. 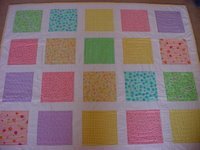 I quilted squares in the squares. 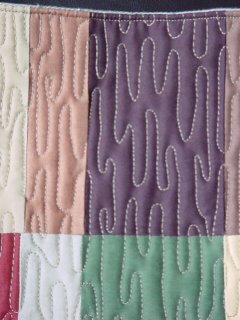 This is probably my 30th (at least) quilt that I have made, and my very first one that is quilted sans puckers. There was much rejoicing, let me tell you! 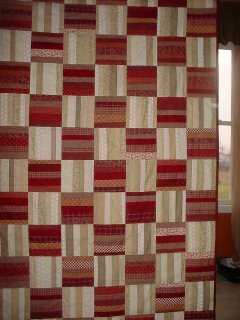 It was quilt #11 that I finished for the year. 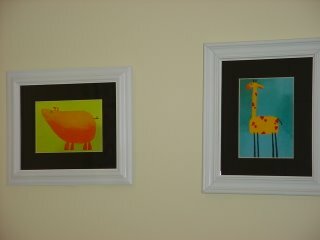 I have several works in progress in my craft room right now. Oh, my, for the stress of craft show preparation. (It is in a week and a half.) I am nearly done with one purse inspired by a quilt pattern. I can't wait to see how it turns out. Photos will be posted soon, hopefully! 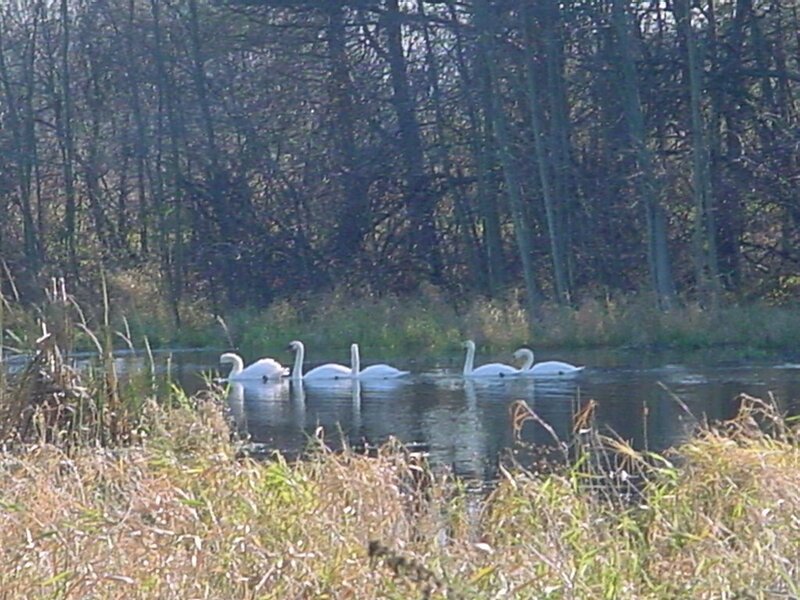 These swans live right across the road from me. They make me so happy! I love walking through the house busily going about my day, looking out my living room window and catching a glimpse of them. Now that the leaves have fallen to the ground I see them several times a day and it's fantastic. Last year there were two and I am happy to see that there are now five. My husband and I have lived "in town" all of our married life up until nearly 2 years ago, when we bought our home in the country. It's a modest but very comfortable house that we have happily been transforming to make it our home. It has been so nice to put our personal touches on this house so that it really feels like our home. Now, because of who we are, we will always have a home that is a work in progress. Always. But there is so much satisfaction in the journey and the end result. This past summer my good friend Erin and her family came to visit me (hurray!) and she got to see our home. She said that she had seen our homes in many incarnations, but this was the best one yet. It made me feel so good to hear that. I have lists and list of things that I want to make to add to my home. The list grows longer and longer as I visit other blogs filled with lots of inspiration. But I am happy with what I've done and I am glad to have lots of fun things to look forward to making. Half the fun in creating is the dreaming, isn't it? A purse made for my little neighbor who is turning 2 soon! ...wrapped up and ready to go. Some little slippers for my girl :0) These teeny tiny slippers make me so happy. I bought these at a craft show today. (They happen to match the color scheme in my house, as my friend pointed out.) 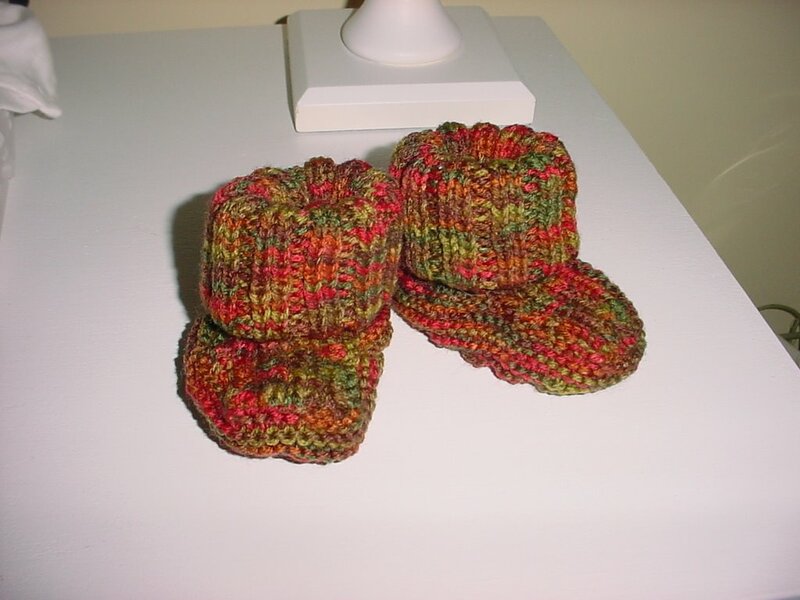 Now I will have to make something for the girl to match these little slippers....possibly learn to knit a teeny tiny sweater to match? Why do I always do this? I am glad that I don't know how to make these slippers , because the girl would have 20 or more pairs of these by the time I was done . I tend to overdo things a bit...at times... ok, all the time! I also bought some slippers for me that are crocheted, but not nearly as cute, as my feet are a size 9. They are so warm and comfy. And at $4.50, they were a fantastic deal. 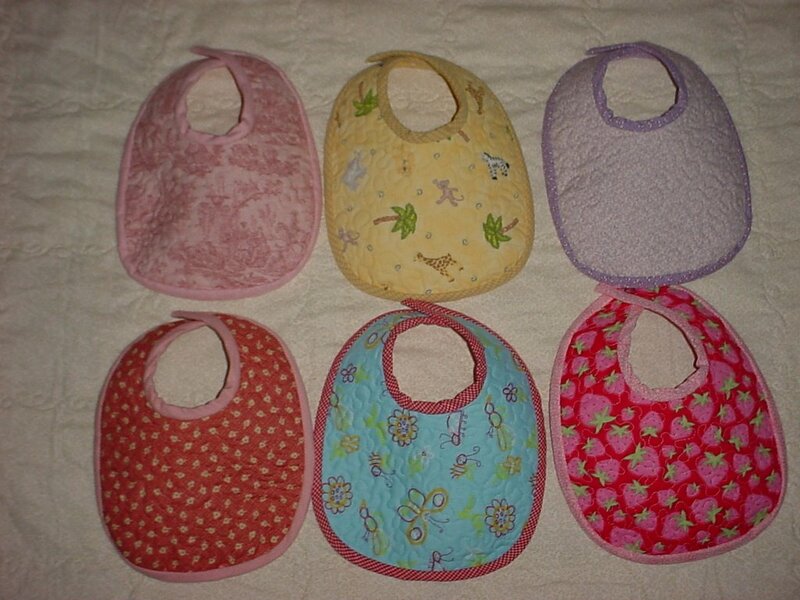 They remind me of ones that my great aunt made for us when we were kids. 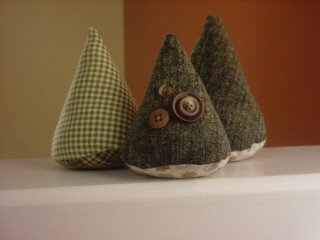 They were usually made of (ugly) green yarn and had the pointy toes... that now remind me of something from Dr. Seuss. 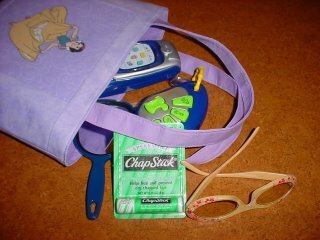 Does anyone else remember these? 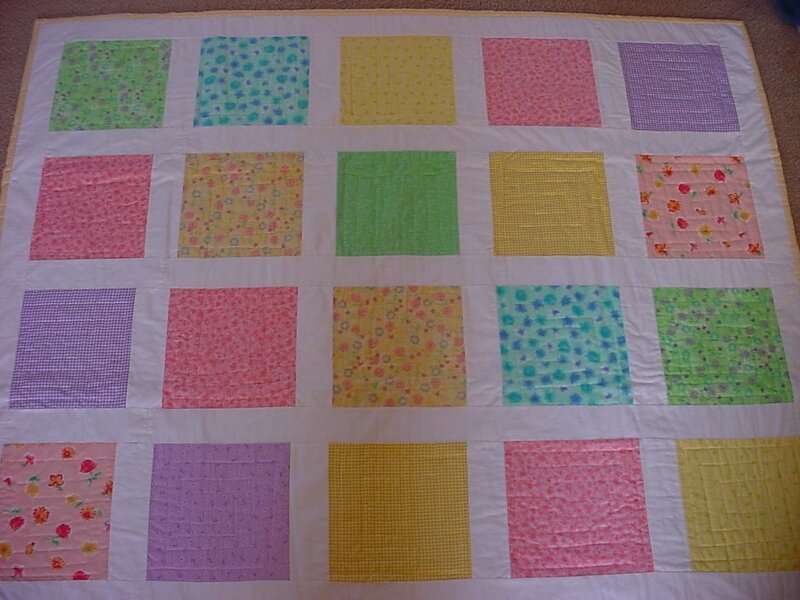 This quilt was made for my neighbor/friend's daughter, Katherine. She was born Nov. 1, 2005. 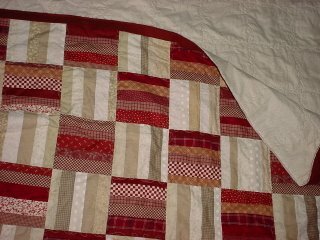 I finished this quilt last Saturday. 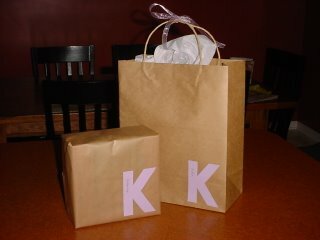 Did I mention that this is a baby gift? I once read that it is acceptable to give baby gifts until the baby turns a year old. Just under the wire. I guess it is a good thing that I could hand deliver it...who knows how long it would have taken me to ship it! 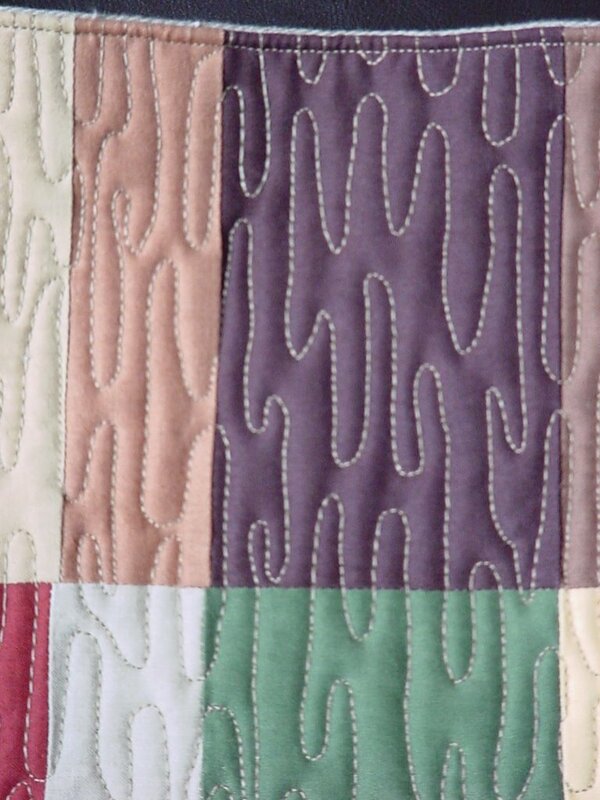 This quilt is made of flannel and chenille. It is so soft and warm. I embroidered Katherine's name in one of the blocks. (I would post a close up picture, but I am so new at this that I can't figure out how to post multiple photos in one post and have it look good....I am so technically challenged.) Anyway, I got to give Katherine her quilt last Saturday, and quilt #12 for the year is finished. Another Work In Progress to cross off the list. Hurray! 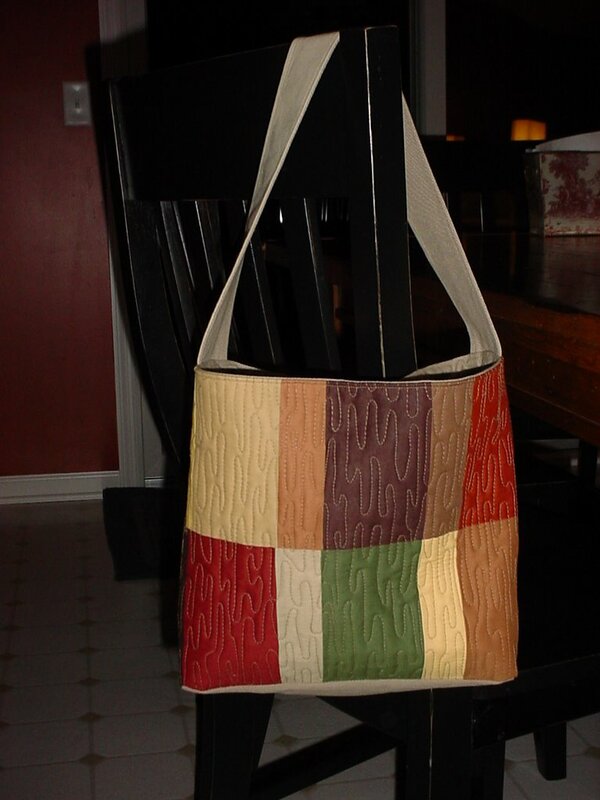 I am on the craft blog bandwagon. I love craft blogs....I LOVE them. I find so much inspiration, humor and delight from these wonderful things. I often chuckle, nod my head and think "I so know what they are talking about". So here I go....hesitantly, I'll admit, because there are so many wonderful blogs out there to look at and I think, "Is there room for one more crafty girl?" I sure hope so! I wanna play.